« The Saga of Friendship and Stitches woven together! 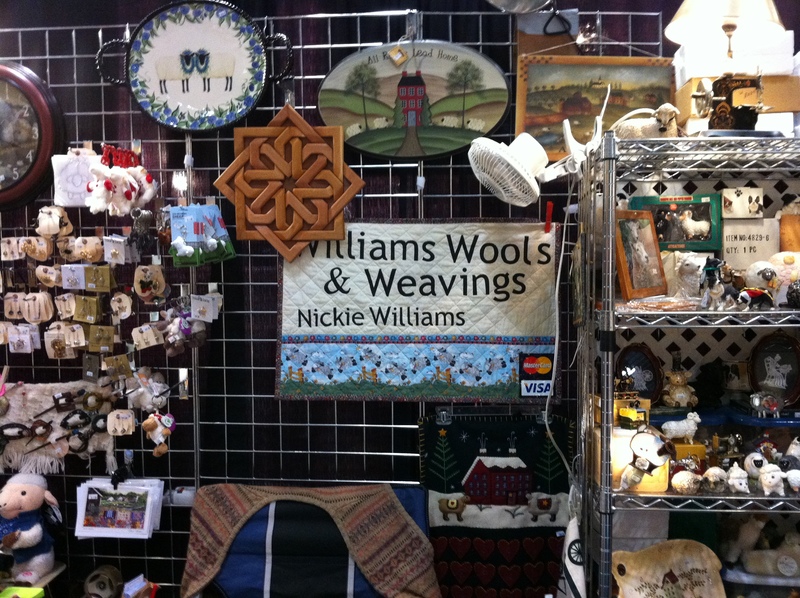 Towards the end of the day we came upon Williams Wools & Weavings….an amazing showing of sheep-related items. This is another booth that I wanted to dawdle in…but didn’t stay long because other booths were “calling” me. 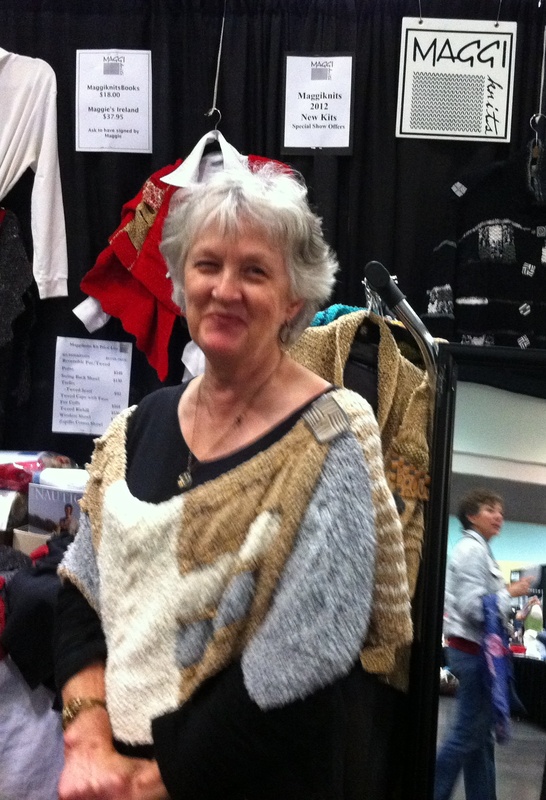 This vendor does not have a web-site…..she sells at trade shows only….she says that her offerings are ever changing and that it would be a mammoth job to keep up on an online shop. 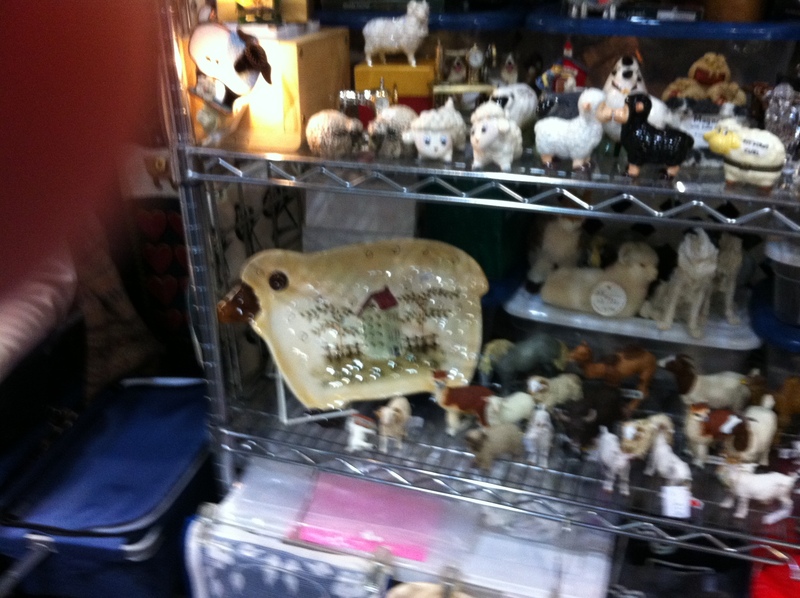 I kept my pocket-b00k intact….but I coveted many items….will shop in that booth next year. In the meantime I will try to find out where else she might be this year. One never knows where travels may take you. I’m dreaming of Arizona soon with my Colorado friend Mary. We’ve actually begun “serious” talks about it. Other random thoughts from the delightful Stitches day. Karen and I ran into our knitting friends, Merle and Cameron. 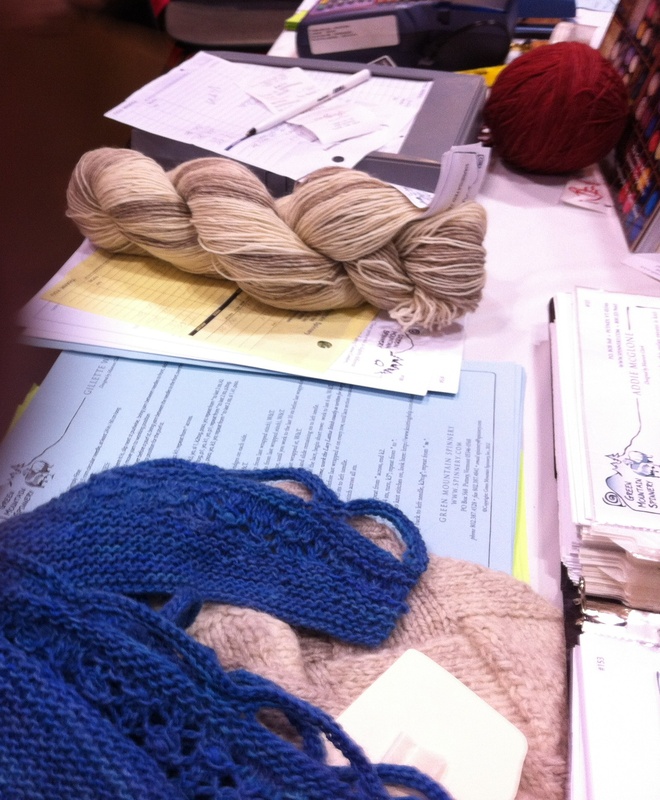 It was easy for us to leave the show floor for lunch at the hotel restaurant….we ate, we visited and saw other knitters. Only at a knitting convention can one stare so openly at what the other is wearing. It’s another kind of feast! 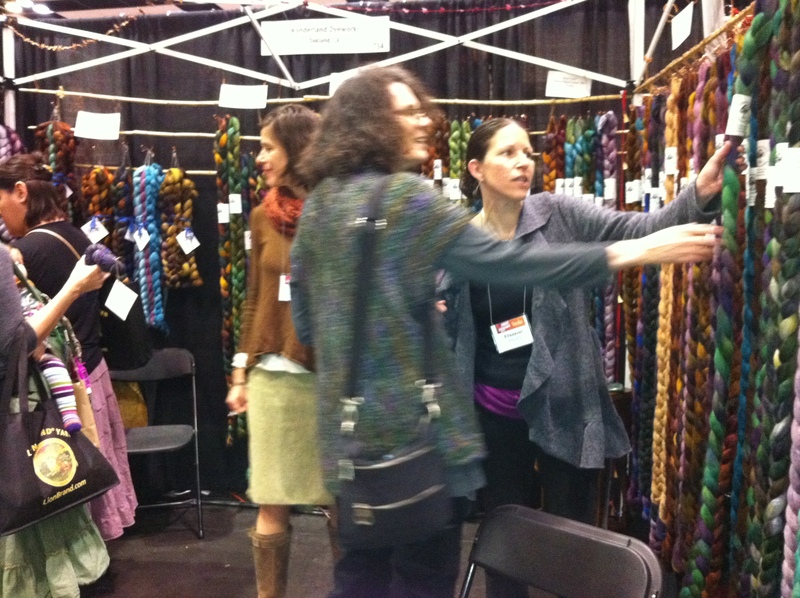 Close by was another booth that caught my eye….Green Mountain Spinnery. I bought three things there…two patterns and one skein of yarn. I got caught in an impulse buy…loved their marketing. One of the ladies was wearing a blue scarf that really caught my attention….it certainly wasn’t the color because I don’t like most blues…but I loved the scarf pattern. I ask about the pattern and learn that it is complimentary with a skein of yarn….well, of course, I bought the skein…yeah and got the pattern. The actual pattern purchases were for a sweater that was also being worn in the booth and then there was model of the tank shell. The Blue Scarf Inspiration.....and my skein of yarn! I love seeing Stan and his wife Bev from Belisha Cashmere.…they come every year from Australia. 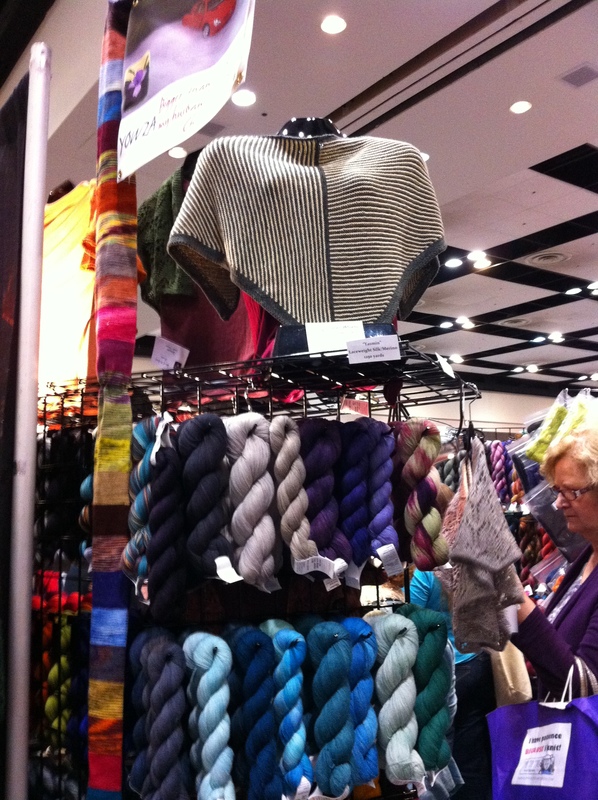 Over the years I have purchased lovely woven cashmere garments and yarn from them…this wasn’t one of those years…and only because I ran out of time and didn’t get to their booth. I did finish a scarf last year which was a blend of two colors of Belisha Cashmere (which I purchased the year before that)…red and grey which produced the most lovely heather color. Most of you know that I have a strong affinity for anything Australian….my grandfather was born there…and I lived there for three years as a child. Blend my love of Australia and yarn….and I love Belisha Cashmere! 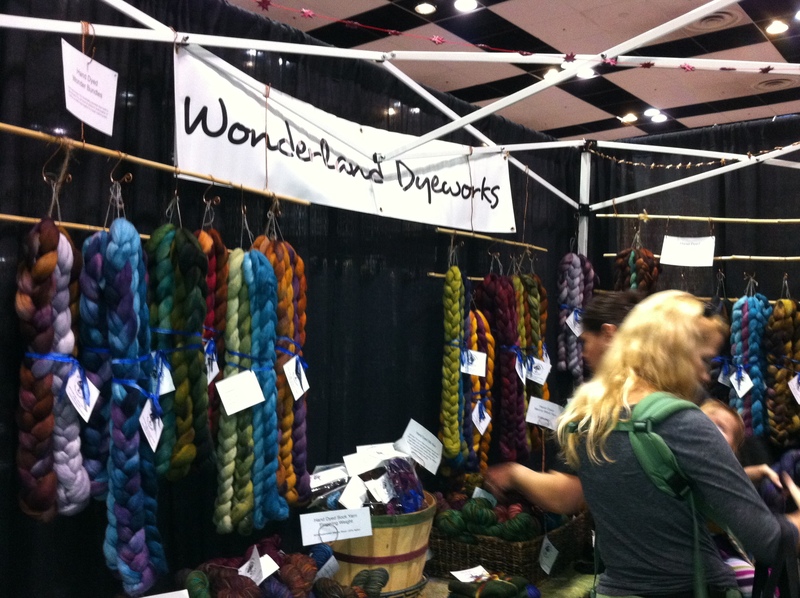 Karen and I ran across another booth of interest…..Wonderland Dyeworks,The yarn offerings were wonderful and if I remember correctly Karen bought some yarn from this vendor. 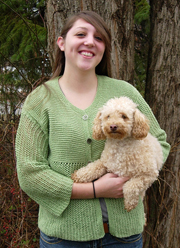 This dyer is local….hails from Oakland….and you find her goods at her etsy store. Along our journey we ran into a woman (so sorry I have misplaced my note with her name and email) wearing one of Stephen West scarf designs.…Karen stopped her to inquire..we took her photo…we talked about the great designs and that one of our fellow knitters – Bonnie – had recently shown her version of “Day Break” at Skein Lane knitting workshop. Bonnie will be featured in another post soon. Karen and I moved on and it was just moments later that we came upon a booth featuring Stephen West designs. 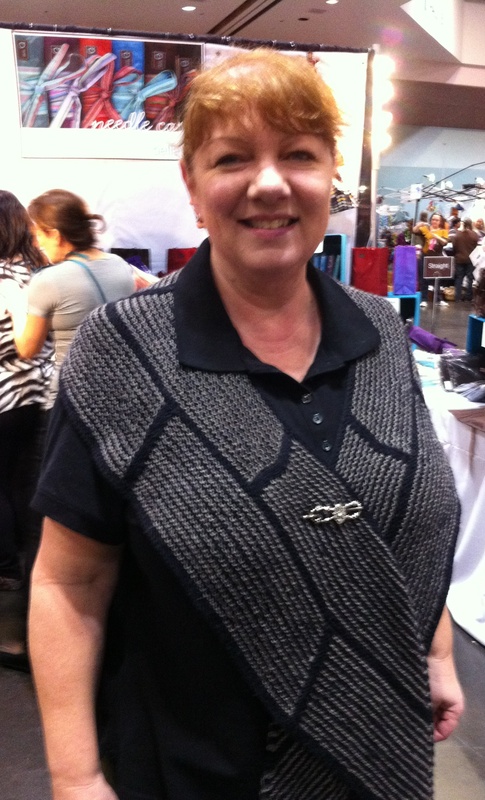 One of the last booths that we visited….and for the second time that day….was Teresa Ruch Designs. Kimberly called when we were driving to the Convention Center…she had been there the day before and had wonderful buying day….but she remembered one more thing that she wanted and it could be found at Teresa’s booth. This yarn is 5/2 Tencel…you can check it out at this site. We visited another booth…and I can see that it was the end of the day…have photos but no info…hopefully it will flow back into my brain! We left Stitches around 4 p.m….we’d had a great day…and knew there was more we wanted to see…but we were done! As we drove home on our fiber high we reflected on the day…so much fun. Karen started laughing and said, “I didn’t have an agenda….and I shopped!” Both of our plans were to look, visit…but we did buy. I can hardly wait to see all of Karen’s renditions. 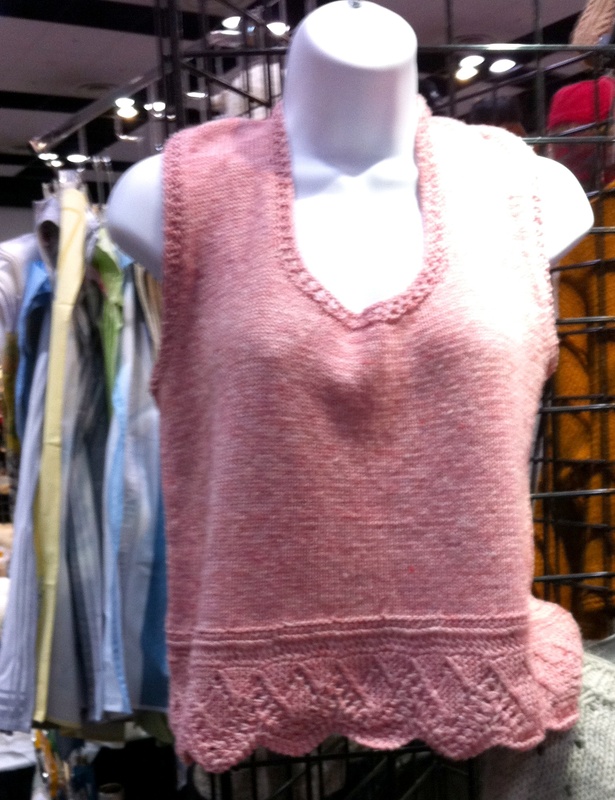 Today I ordered the kit for the model I tried on in MaggiKnit’s booth…you can look forward to a knitalong for the new Large MK Cotton Cowlfrom MaggiKnits. Stay tuned for more news about that!